The church is uniquely equipped with a variety of gifts, callings and passions to effectively engage the foster-care crisis in our country. The opportunities to get involved are endless and full of possibilities. Here are nine unique ways your church can practically get involved by mobilizing people to not only care for kids but also support those who do. Spend a Sunday (or a series of Sundays) preaching about the gospel and God’s heart for the orphaned and vulnerable. Make the call clear and broad—we’re all not called to do the same thing, but we’re all capable of doing something. 2. Host an informational meeting. 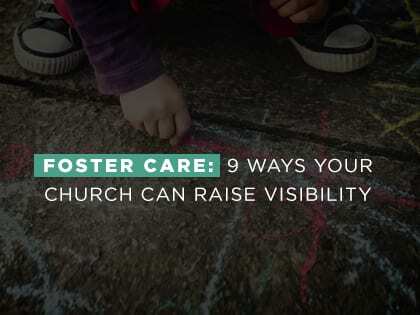 Provide an opportunity for people in your church to gather and learn more about how to get involved with foster care. 3. “Dedicate” foster parents in your church. Ask local agencies if there are any specific needs they know of that foster families have (general home maintenance, lawn care, car repair, etc.) and mobilize serve teams to take care of those needs around your community. 5. Host a date night for foster families in your area. Your church can hire certified babysitters (or recruit volunteers) for a Friday or Saturday night and allow foster parents from the church and community the chance to go on a date. Throw a big party for foster families in your church and around your community. Maybe it’s a BBQ picnic at the park, inflatable bounce houses and games at the church or even a nice appreciation dinner that shows them they are seen, appreciated, loved and supported. 7. Serve at a local child welfare office. Child welfare agency offices often double as waiting rooms at all hours of the night for kids waiting to be placed and parent/child visitation spaces. Ask if there are rooms that need makeovers and provide the materials and labor to create more welcoming and comfortable environments for the kids. Children are often removed from their homes and placed in foster care with little to none of their own clothes or possessions. Find out from your local agencies what items kids who are being placed need most and organize a volunteer team to collect them. Pray for kids in foster care, the families they come from and the families that are caring for them now. Jason Johnson is co-founder of the Orphan Care Network and director of church ministry initiatives with Christian Alliance for Orphans. This article was originally posted on his blog.